The Original is Always Better. I’m surprisingly old-fashioned and big on tradition. The recent trend of remaking classic movies is driving me bananas, quite frankly. I’m disappointed in Hollywood’s lack of creativity! I grew up with the Gene Wilder version of Charlie and the Chocolate Factory. Needless to say, I only needed to watch a few minutes of the newer Johnny Depp version to know that it just wouldn’t do. Too dark, too creepy, too WIERD. My kids, age 6 and 4, felt the same and vastly prefer Gene Wilder as Willy Wonka. They love the movie, period, with or without the comparison to the newer one. I was pretty psyched when I had the opportunity to get a copy of the book, because…guess what? I’ve never read it! 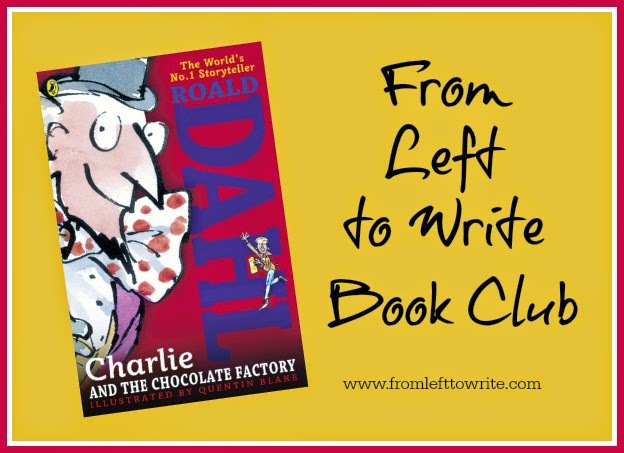 I wasn’t into Roald Dahl much as a kid and as an adult, I was busy reading other books. Alice, who just turned six, was excited to read it with me. She is just getting into chapter books and while she can read some chapter books independently (Henry and Mudge books are a popular series in our house right now), she likes being read to. It’s been exciting to move beyond picture books to novels that require her to listen and create imagery in her own mind. 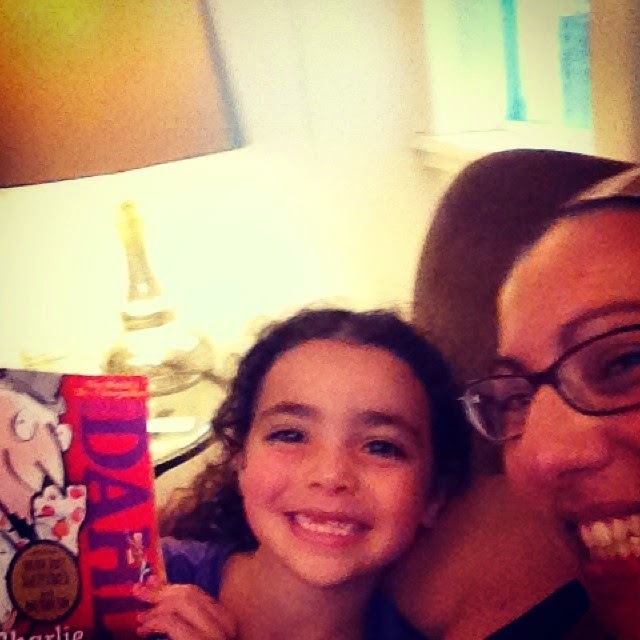 As an English teacher, this is the part of parenting I have long looked forward to–sharing novels with my kids and nurturing a love of reading independently. “I recommend this book because it’s the best chapter book ever. My favorite part is when they go in the Chocolate Room. All Mr. Willy Wonka’s dreams were in that room. I like the fact that you can everything in that room! I like that the trees are made of lollipops and the grass is minty sugar. Previous Post This is The Story of a Happy Marriage (or How a Book Club Was Born). 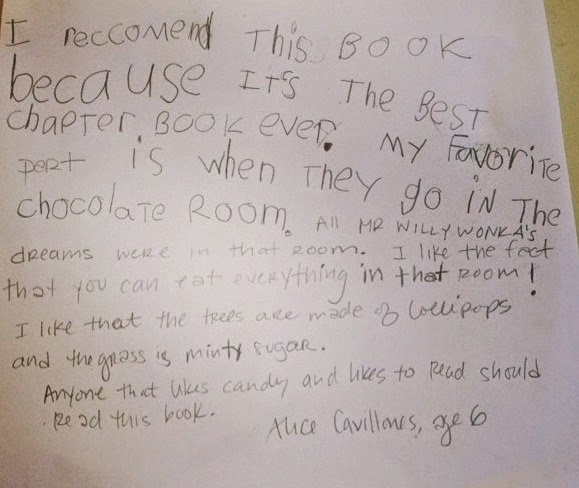 I love that Alice reviewed it. I still remember reading it as a kid – I think it was when I had chicken pox. It made me really want chocolate. How wonderful that she reviewed the book and appreciates that the book is better than the movie. Love that! I always prefer the book over the movie myself. One of the great joys of my girls growing a bit older has been the move to reading chapter books together, sharing the books I loved as a child and discovering new ones together. Wonderful review Alice, keep reading! Yes, your desire for chocolate is a testament to the quality of writing in that book!! I was really surprised that she was into listening to the book because I've tried with other books when she was in Pre-K but I think listening to her Kindergarten teacher read aloud this past year helped with that! She reads very basic chapter books…Henry and Mudge is great because each page only has a few words on it and they are usually only 3 or 4 chapters long. Books like Ivy+Bean, she reads on her own with me close by to help or take over when she gets tired. I really hope she will like the classic books I loved growing up, like Anne of Green Gables or Nancy Drew. Your daughter writes very well! Great book review!